USB Type C is awesome - twice faster than USB 3.0, side-agnostic, and with the whopping 100W and 5A output, it is the future, and Android phones will apparently get those goods pretty soon, mentioned none other than Google itself in the promo video below. Upon presenting the new all-powerful Chromebook Pixel yesterday, what with the Core i5/i7 processor and the rather appalling 32 GB/64 GB storage for the $999 starting price, Google mentioned its commitment to the USB Type C port, of which the new Chromebook has two. That commitment won't stay with laptops like the new Apple MacBook or the Google Chromebook Pixel, it seems, but will also translate to Android handsets. The Android-with-type-C quip can be heard towards the end of Google's promo video, where Adam Rodriguez, Chromebook's Product Manager, says "expect to see this in a lot of Chromebooks and Android phones in the near future." 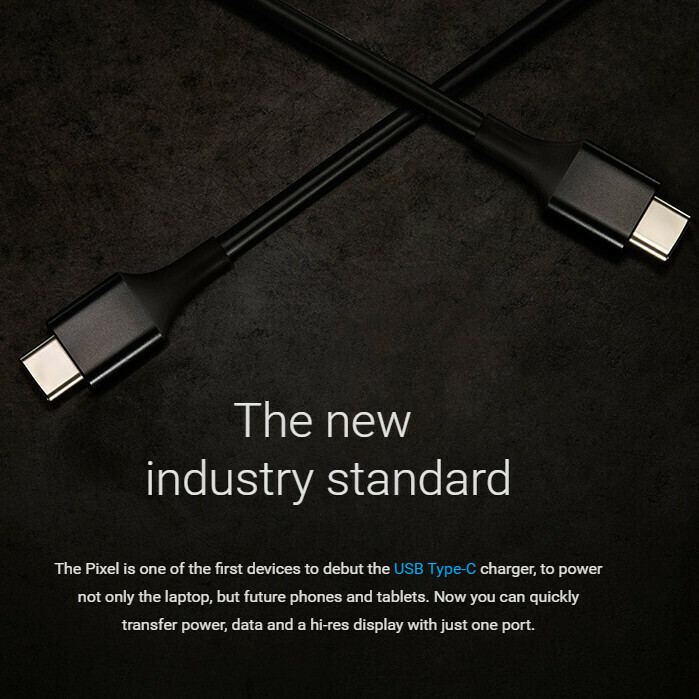 Moreover, Google mentions in the new laptop writeup that "the Pixel is one of the first devices to debut the USB Type-C charger, to power not only the laptop, but future phones and tablets." Sweet. We haven't heard any rumors about upcoming flagships from Samsung, Sony, LG or the rest, that say these will be coming with USB Type C, but this year's Nexus phone(s) edition might sport the fast, compact and side-agnostic connector. Hear, hear. Its not really news .. since the anouncment of Type-C that is known it would come to phones and tablets..
Yea, this was inevitable for Android and Windows devices The more interesting question is are Apple also going to switch USB 3.1 Type-C for their iOS devices? No they won't. Apple makes a lot of money with licensing their connectors for peripherals. This is the main reason they went with the lightning connector instead of microUSB $$$. Well, look like Apple speaker and dock manufacturers must quickly dump their existing lighting connector accessory before its actually become official. Isn't it wonderful to be able to buy new speaker dock every other year. Such joy! Because it would be suicide to sell a computer without USB-ports for any peripherals. As you may notice it is not used for charging. They went with lightning because it is better in any way than USB standard. Apple already uses type c in it's new line of laptops so it's safe to presume that also iPhones/iPads will get it. Lighning on one side, usb whatever on the other. Nothing will change. Who are the idiots that upvoted you? Lightning is in no f**king way better than USB, just different to be proprietary. Have you ever had some lint or some dirt stuck in the miniUSB? or the regular USB bent that it doesn't wanna fit anymore? After using Lighting for a year and a half, you realize how cumbersome using USB is with it's right side up... Mini USB is even worse because in the dark you fettle with one way, than turn it over just to realize you had it right the first time. And then there's the instant gratification feeling when that lightning snaps in unlike mini USB where you're not really sure if it's all the way in because it feels wobbly... All my daughter's toys have Mini USB's - I know the difference between lighting and USB/miniUSB, and post #10 is absolutely right about it being better... but I doubt it will see iPhone/iPad application due to wattage and amperage rate, but who knows. Proprietary? yes. Inconvenient? absolutely NOT! My iPad 3 is on the 30pin and our phones are on lightning. My speaker docks are all lighting and one is 30pin from 5 years ago (I dont know why we still keep it) - but we rarely use them to charge the phones - Bluetooth is KING!!! ... or that ^ Hey, is it for sale already, I want to see how the connector compares to the lightning cable. There's this solid feeling when lightning clicks in, plus no dirt or lint can be trapped, nor can you accidentally bend the outer metal like you can on regular USB or mini USB.. (some of the things I like about the lightning).. At least the USB-c is reversable, but the benefit of that one is more power delivered: 5amps I think... the iPad charger only goes up to 2amp and iPhone 1amp... I was hoping that Apple opened the licence to lightning instead of the world pushing for type-c but this is a great new design... hopefully we fully move to that connector quickly specifically mobile devices... Unfortunatly many will be left using old cables or adapters as the world is floded with USB and mini USB... we'll see. Thanks Vince, very informative. I guess I can rest easy that my lightning isn't going away anytime soon. If you are lying restless worrying about the future of lightning I don't know what to tell yo besides seek psychiatric help. You should pray for Apple adopting a standard like USB 3.1 Type C.
I really like the solidness of lightning connector... sorry to ruin your day, buddy. "rest easy" was a figure of speech - dont take things literally (or are you just bashing an Apple user for being an Apple user - than you should "seek psychiatric help"... Seriously, why do people bash on others for enjoying something they dont? I dont care if you hate everything Apple, but why attack me? I like how Apple made it look like they've invented it. I wonder if the Z4 will already use this. The picture of the article above is the new MacBook with USB-c. I hear Nokia N1 Tablet already shipping with it. So, I think adoption will be fast..
Nokia N1 using it is already on sale. 10 bucks say the new Nexus phone is going to be the first phone with it. Nice move.. however, the Lightning connector is far superior from a durability and design standpoint. Nothing beats having a solid, thick, reversible connector. Having that tiny, thin PCB that must be inserted into the USB connector is definitely a weak point - wish they would do a lightning type connector. Looking at Lightning next to a USB 3.1 c connector, I am wondering what makes you think they are that different? it in terms of thickness and such they are almost practically identical? So what do you base this on?